For de DS213j I don’t remember the first version of test, but I updated to the last (6.2.1-23824-2) and I get the same issue. For DS918+ with versions 6.1.7-15284 and 6.2.1-23824-2 too. I tested the latest release (2.0.4.5 beta) on a DS211j and a DS218+. For the DS211j I found that Duplicati didn’t work reliably. Roughly half of the connection attempts with B2 cloud storage failed due to HTTP errors. When a connection did work, starting a backup run already took minutes – that was before the first file started transferring. Lack of space on /tmp further complicated matters. The latter problem could likely have been resolved with some effort. The former couldn’t. I concluded that the DS211j is likely too slow to run Mono/Duplicati. My attempt with the DS218+ fared much better. Installation was smooth, and I had the first backup running with little effort. I haven’t checked yet if the restore bug is present on the DS218+, but can report back on this. DS418play (DSM 6.2.1-23824 update 2) … Installed mono (4.6.2-0096 ) and Duplicati (2.0.4.5) and Duplicati won’t run. Tried to launch using package icon and all I get is “connection to the server is lost”. Hi @Random, welcome to the forum! Can you tell if the connection lost message coming from a Duplicati page or DSM one? If the Duplicati server is starting then crashing there should be a lot file recoding the error, but in not sure where it would be located on you machine. I’ve got a “baby” DiskStation - a DS115j - but it’s got 3TB of storage available (I just cleaned out the junk last night). I just lost of bunch of personal data to a drive with a corrupted filesystem, and despite knowing better, I didn’t have a backup system in place. I’m running Manjaro (Arch) LInux, and I’m a developer. Thankfully, I regularly push my code to GitHub, so I can get that stuff back. What’s gone is all my pictures, music, settings, etc. Argh. It’s really surprising to me that Synology doesn’t have a backup “backend” program that supports Linux. I’m going to keep reading the site (and studying this thread more carefully), but I hope there’s something better than having to manually schedule rsync or rdiff runs myself. Has anyone tried putting a Linux backup server instance inside a Docker container on a NAS? That thought came to mind, but I’m not a Docker guy, so I’d have some learning to do. When I’m in Package Manager I see Duplicati… it’s button says “Run” or “Uninstall”. I select run, and after a few seconds the button shows “run” again, instead of stop. When I use the Duplicati icon (on the installed package dropdown (from DSM in browser tab), a Duplicati window appears with the “connection to the server is lost” message and then a countdown to the next connection attempt is displayed. I doubt there ever was a connection since the Run button is always present in Package Center. Has anyone tried putting a Linux backup server instance inside a Docker container on a NAS? Hi @bundito, welcome to the forum! Sorry to hear about your data loss. If you are asking about running Duplicati in a Docker container then yes, that’s doable (at least it with for me). I use it to back up my unRAID NAS files to an off-site location. If you’re wanting to run Duplicati on your Synology box you may find using their package easier to with with than a Docker container. Of course, there’s no reason you can’t try out both and see which to prefer - just don’t try to share the same destination folder. Installed Duplicati followed by Mono, and did not work. Tried the other way around too (Removed Duplicati, and installed it again - where Mono was present and running on the system). Restarted the system to give it another chance, but same results. Have you tried the workaround I posted in this thread? Just to flesh this out a bit, does anybody know Synology paths to the Duplicati folders (like for doing a downgrade) or do DSM package not work that way? Also, have any of you tried uninstalling Duplicati and, if so, were they any left over files needing manual cleanup? I ended up redirecting this (by using a symlink) to my 16TB NAS disk volume, as root is only 2.3GB on my NAS. I could have sworn there was a server parameter to let you specify the “home” folder (as an alternative to a symlink), but I can’t seem to find it now. On regular Linux there is - you can just modify /etc/default/duplicati. But Synology doesn’t seem to have that equivalent. Symlink seems to work OK for me. 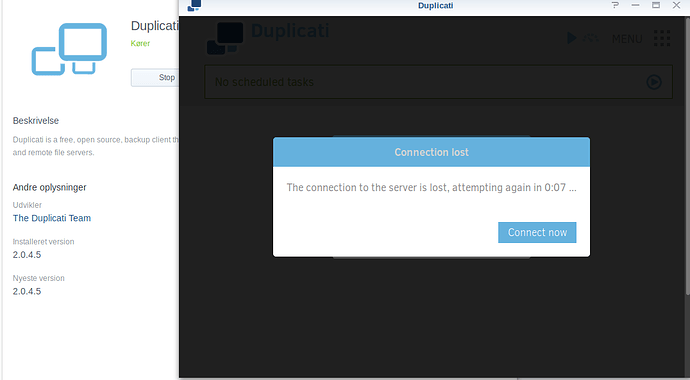 Hey, I also have problems with Duplicati on my DS216j running DSM 6.2.1-23824 Update 4. I use Mono 4.6.2-0096 and Duplicati 2.0.4.5. And my user is member of http group. So looking at the Threads I found so far here, I should not get the “Connection lost” error. Any idea? I didn’t check the “path with spaces” problem. Hi @kliclick, welcome to the forum! Thanks for sharing your method of running Duplicati on your NAS. Do you find / feel using A Docker container is any better or worse than a native spk? I used a Docker container because I couldn’t install a working spk in my Synology (DS1511+). But it took some time for a simple user like me to have all the settings working with the Docker container. A working native spk for me will be much easier to set up. I don’t know how to upgrade the Duplicati version in Docker (never looked for how-to’s in the internet), I don’t know if it’s better in terms of memory usage or other performance specs, etc. I tried the spk first, and I think it’s the easiest way. My answer (I repeat, as “normal” user) is that spk would be better.